If you love the great outdoors, Maryland is a fabulous place to be. You can be at the beach one minute and hiking in the mountain an hour later. With diverse terrain, stunning natural landscapes and vistas that go on for miles, this is truly a hikers’ paradise. Here is our list of the best hikes in Maryland so grab your shoes and hit the trail! We're not talking about the Washington Monument in D.C. but the original Washington Monument on the Appalachian Trail. If you drive into the mountains near Boonsboro, Maryland you will find this Historic Landmark perched atop of the Appalachian Trail. The walk from the parking lot is only about 20 minutes but from this point you can see Maryland, West Virginia, Virginia and Pennsylvania. It is smack dab in the middle of the Appalachian Trail, making it the perfect spot to begin your hike in either direction. Located in Thurmont, Maryland, is Cunningham Falls State Park. This is one of our favorites because there are miles and miles of hiking trails but you can hike up to one of the best waterfalls in the area. It is absolutely stunning after there has been a decent amount of rain or snow. In the summer months, the falls is not quite as spectacular but at the base of the hike is a beautiful lake surrounded by trees. With a sandy beach and concessions, it is the perfect place to cool off after a day of hiking. Cunningham Falls State Park shows just how diverse Maryland is. When hiking here, you could swear that you were in the Pacific Northwest. More of a gentle walk than a hike, Quiet Waters Park in Annapolis is ideal for young children or those that may have issues with stability because the trail is paved. This is incredibly convenient while still beautiful. If you go all the way to the end of the park, which is highly recommended, you will be rewarded with an absolutely stunning and unobstructed view of the Chesapeake Bay. On a blue sunny day, the view is nothing short of breathtaking. For hiking in the city, head to Gwynns Falls in Baltimore. With 1,216 acres of parkland, this is the largest park in the city with numerous trails, playgrounds, tennis courts and more. It is an excellent way to get outside with the family without having to drive very far. 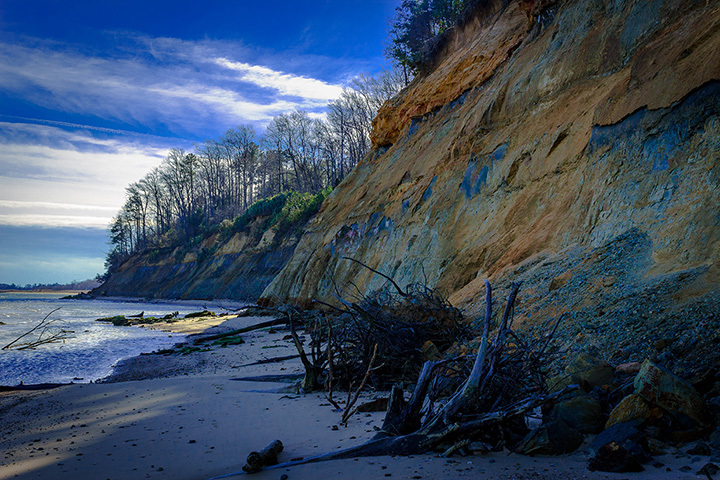 If hunting for dinosaur fossils thrills you, or your kids love hunting for shark teeth, there is no better place to do it then the Calvert Cliffs in Calvert County. This hike is certainly an adventure because once you reach the bottom of the cliff there is a beach where many people have found fossils. In fact, if you bring a shovel it is rare that you won't find something. The kids love it and the views along the way are absolutely amazing as you will go through the marshland where you will find native birds and even turtles. Just be warned that it is significantly cooler at the bottom near the beach than it is at the parking lot and that it can be steep in some spots for young children. Located in Laurel, this beautiful refuge is the only of its kind in the United States. Established by Teddy Roosevelt in 1936, the refuge is full of fantastic trails, marshland, the river, a pier and wildlife galore. Just be sure to take a break from the trail to check out the nature center where you can learn all about the research they have been conducting about animals native to the area. Head to Gaithersburg to hike or mountain bike in the trails within this Montgomery County Park. The main hiking trail is 7.8 miles long and there are two historic sites along the way in addition to an overlook with views of the stream valley. If you are looking for a relaxing place to hike that leads to a beautiful beach and is incredibly close to Annapolis, Terrapin Beach Park in Stevensville is an ideal destination. The trails are also excellent for mountain biking and for watching the birds. Since the hiking trails lead to a beach, this is the perfect outing for a summer afternoon. If you want to hike, camp, and rent a boat to head out on the water, the Pocomoke River State Park is an ideal destination. Located on the eastern shore of Maryland not far from Ocean City, this is an excellent way to spend a spring, summer, or fall weekend and there's so much to do that you will never be lost for activities. While most people think of the mountains when they go hiking, Maryland has plenty of beach hiking as well. When you head to the Assateague Island National Seashore you will be able to hike along the beach and near wild horses. It’s an exciting adventure to see horses running near you in their natural and wild habitat. With the ocean at your feet, there is no place more beautiful or serene on the Eastern Shore. In California, Maryland you will find an undisturbed 250-acre lake and nearly 2,200 acres of undeveloped land and forest. St. Mary’s River State Park has a seven-mile trail that will take around two hours to complete. You will have picturesque views of wooded areas, the water, and birds. If you feel like veering off the trail for more of an adventure, they have several you can choose from. Walking trails surrounded by trees with only a gentle incline grace Gilbert Run Park. The park also has plenty of picnic benches, a children's playground, a lake with fishing and even boats that you can rent. The main trail is around two miles long and the views are absolutely spectacular. Be prepared to pull out your phone and take plenty of pictures of the fall leaves change and you see their colors surrounding this serene lake in Charlotte Hall, Maryland. For avid hikers looking for a more rural and rustic experience, head to Thurston Griggs Trail. This is a rocky trail in the mountains of Hagerstown surrounded by trees, so you may want to bring a hiking stick with you and at least wear very durable and rugged shoes. Rocky and steep this trail is not for a novice hiker or for young children. However, if you are looking for a challenge this is an excellent trail to visit. Located on the Catoctin Mountain outside of Frederick, this state park has a well-developed trail system. At higher elevations, you will be treated to stunning views of the farmland below and the trees surrounding the trail are truly spectacular three seasons out of the year. Since there are multiple trails to choose from, you can select easier ones for the family or rocky and rugged trails for the adventurers in the group. With miles of hiking trails, horseback riding, a fishing pier and beach, Greenwell State Park in Hollywood is an excellent place to take the family and enjoy the great outdoors. This is an ideal destination when you want to please multiple people in your group. The hikers will enjoy the trail but if other people in the family would prefer to fish, you can take a break and do that as well. There is no doubt that Maryland has some of the best and most diverse hiking in the United States. Most of these trails can be enjoyed year-round so buy a pair of hiking boots and get out there! View more Maryland Hiking Trails.